Definitely one of my best recipes to date. This bread is addictive, you are lucky it makes 2 loaves because one would be a complete joke! Seriously I took my moms zucchini bread recipe and I made a considerable amount of changes. I am not good with bread recipes, so I tend to change up a handful of my basic recipes. That is what I did with this one anyway and it is MAH-velous! As you will read in the recipe I chopped one apple and I grated the other. In the photo you can see chunks of apple and that my friends, is like a lucky surprise! 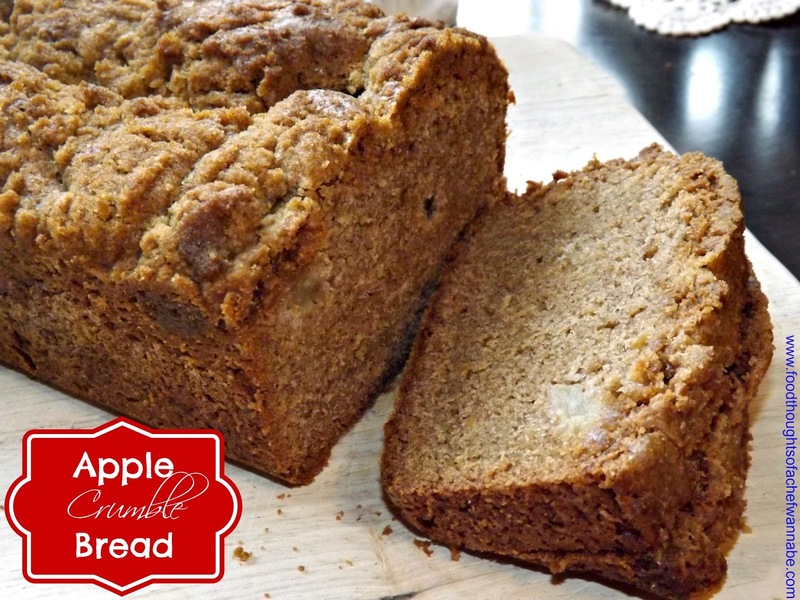 The grated apple adds sweetness throughout and the chunks are just beautiful things! The crumble on top makes this bread one step closer to heaven and you won't even need butter or anything on it. I just was hungry for bread, like banana bread but not. So I did apple and then wanted a crumble top and oh no, I drooled again. Let's get this in your ovens! Preheat your oven to 350 degrees F. Spray 2 standard loaf pans with non stick cooking spray. In a large bowl or stand mixer bowl, combine eggs and sugar and let rip until it is completely combined. Add in vanilla, baking powder, salt, baking soda, and cinnamon and mix until it is nice and smooth. Now add in flour AND apples. Mix again until combined. Divide into 2 loaf pans. Then make your crumble. Combine using a fork, until it is all mixed. Divide between your two loaves of bread and then bake for approximately 50-60 minutes. When a knife or toothpick poked into the middle comes out clean of wet batter, you are done! Remove from the oven and let cook 20 minutes on a cooling rack. Remove from loaf pan and dive in, both feet AND your head. It is DELISH! You have until 6pm CST on April 7th, 2014 to JOIN THIS SITE, and leave a comment for a chance to win 3 products from the "Foodthoughtsofachefwannabe: Recipe Inspired Candle Collection" by Old Glory Candle Company. I have handpicked 3 items for one of you! I will use random.org to choose a winner, after your membership and comment is verified! So, here is the thing about family. Sometimes they completely blow. I mean, usually they rock but once in awhile there is one rotten egg and her name is Maegon. She is very close to my age, she is my niece, we are more like sisters but none the less, she blows. She won't share her chicken enchilada recipe with me. I mean she just straight up said, "NO". Well, nobody puts baby in a corner people, NOBODY. My niece claims to make the best, "Oh EVERRRYOONNE loves them" kind of crap. She goes on and on and I said to her I wanted to make them and maybe share them, she replied as I said before, "Nope, it is my secret recipe". Oh seriously?!? She obviously isn't into the joy of sharing like a REAL foodie is and frankly I think MY recipe, might give HER recipe a run for its money. You won't give me yours, excellent, I will make my own. GAH! Been a long time since I started a blog with a rant, and about family of all things. See Maegon, see what you DO to me? Make this, and if you are really amazing, you could do a cheese sauce instead of just cheese over the top. I didn't want to risk sliminess so I went with regular cheese over my sour cream! Combine all ingredients except flour tortillas in a large bowl and combine ingredients until all mixed. Preheat your oven to 350 degrees F. Start filling your tortillas with filling. Fill in a line across the middle and roll up and place in a 9x13 pan. Continue until all are in the pan. Spread over 3/4 cup more of sour cream and top with 1 cup cheddar jack cheese or cheese of your choice. Bake in the oven for 30-40 minutes or until heated through and the cheese on top is melted. This is a nice mild flavor, nothing to spicy or kicked up, although you could add hot sauce or red pepper flakes to any part of the mix! Also feel free to top this with any sort of "sauce" you like, I just wanted plain ol' cheese! These poor muffins, have been waiting and waiting for my attention. I made these weeks ago, the next day I was due to spend a few day at my parents. 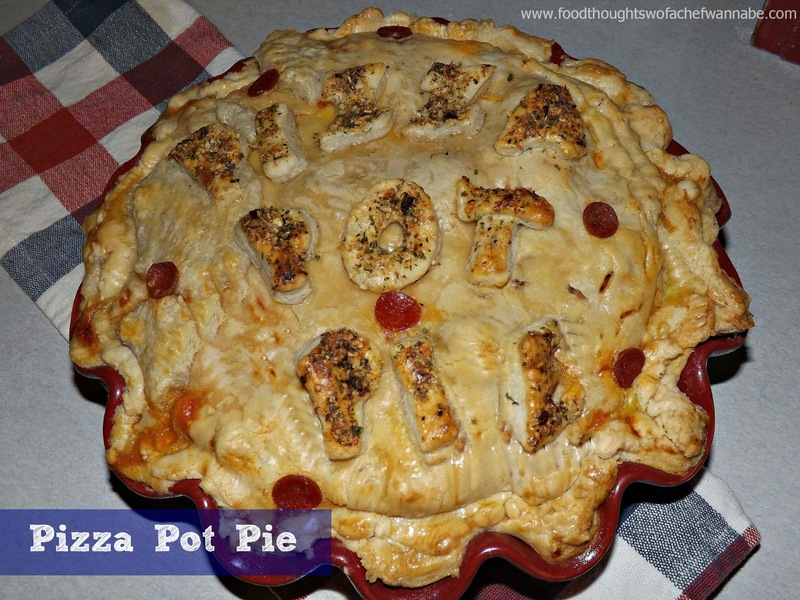 I took my written recipe, because I was going to get this post written while I was there. Yeah, RIGHT. Didn't happen. I returned home, only to find, the recipe didn't make it home with me. I frantically called my mom who had the recipe and for 2 weeks, DID NOT send it to me. GAH! Well, I am back at my parents, I have my recipe safely in hand and now I can finally share it! These muffins are so good. Not to sweet, but sweet enough and perfect served slightly warmed with a little, or a lot, of butter! Don't forget the coffee!! 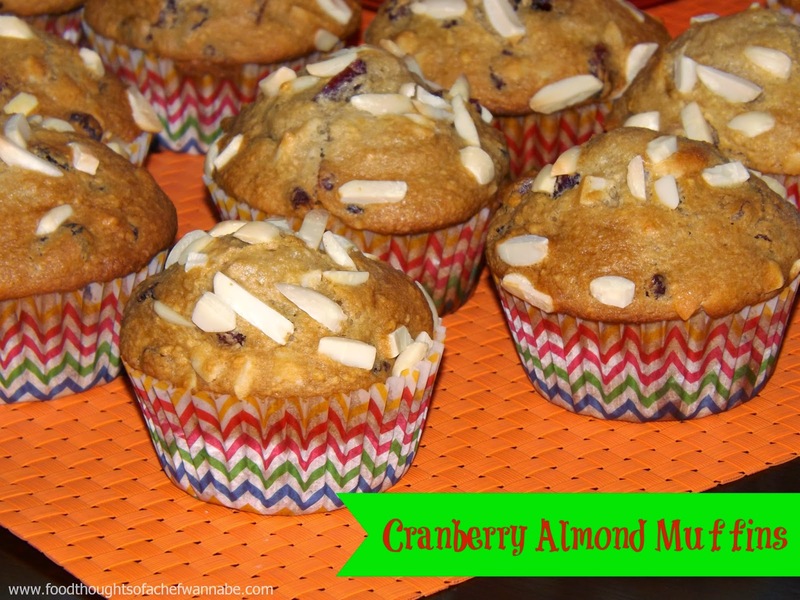 As usual, change out my cranberries and almonds if you choose. Maybe you like other things better, so go ahead, make them exactly how YOU would love them! These freeze like a dream, I had some here at my parents and just took them out of the freezer, warmed one up and ate with my coffee. I mean, it was a job related snack as far as I am concerned, I forgot how good they were, I needed reminded. Preheat oven to 400 degrees F. Grease your muffin pan, or line it with liners. Set aside. 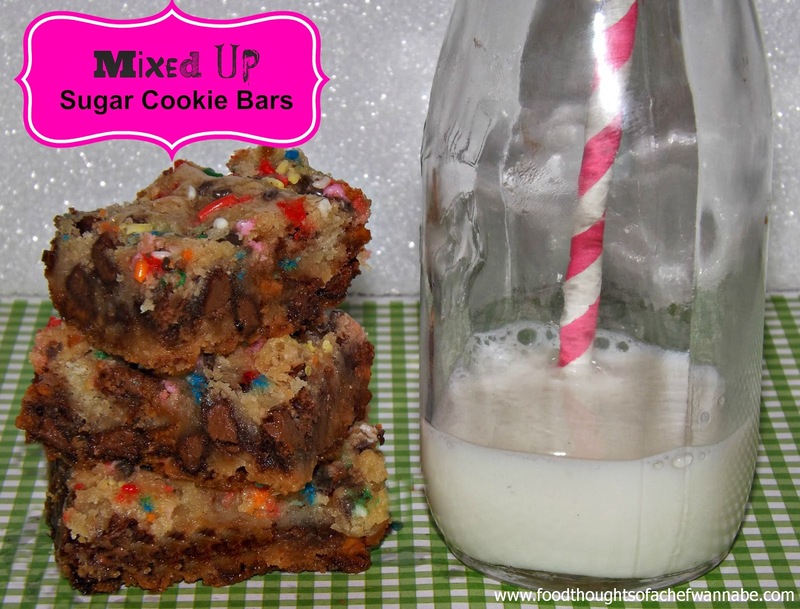 In a large mixing bowl, or bowl of your stand mixer, combine, flours, brown sugar, baking powder, baking soda, and salt. Mix until combined. Add in eggs, applesauce, cranberries and 1/2 cup of slivered almonds. Mix until JUST combined. Fill muffin pans with batter. This should make 12-15 muffins. It all depends on how full you fill them. Using the remaining 1/4 cup almonds, sprinkle them over the tops. Bake for 15-18 minutes. When a toothpick inserted into the middle comes out clean of wet batter, they are ready to nosh on! Enjoy these, for brunch, breakfast, a snack, or the meal after dinner! Just as the photo implies, it is a pizza lovers dream! I had contemplated the filling for this beauty for a few days. I love meatball pizza, hubby loves cheese only, and the rest was just random. Oh how beautiful random can be! I had some leftover dough as you might notice. Feel free to cut fun shapes out for the top, I just used the seasoning on those so they would stand out more. In the recipe I just call for sprinkling the entire top with pizza seasoning, but you roll down the road that makes you happy. Feel free to add mushrooms, olives, ancho...no I can't even type the word, but you know what I mean. Whatever you like on pizza, add 1 cup of it, or divide it, so it equals a cup, if you do much more, you pan will runneth over. I am all for things running over, but, not when it involves the possibility of having to clean the oven. BUT I did put it on a cookie sheet to bake just in case. I suggest you do the same! This seems difficult but it isn't at all. As long as you make sure you have sealed the edges and heaven knows you must have plenty of cheese, all will work out fine! It even got my husbands, "wow, I wouldn't change a thing" approval. The longer you let it cool, the more of a "piece" you can get, but really, just dive in! Preheat your oven to 350. Remember you will need a DEEP dish for this! In a large bowl combine your prepared sausage, pepperoni, meatballs, all cheeses, and sauce. Mix until completely combined. Set aside. Take your pie crust and roll them out just a smidgen, so they are SLIGHTLY bigger. Not to thin just give them a good roll in each direction and call it good. Spray your pie plate with nonstick cooking spray. Place bottom crust into your deep dish pie pan. Make sure not to stretch it, just ease it into the bottom. Place ALL of your filling mixture into the dish. It will be over full, that is perfect! Smooth it as much as you can and place the top crust on. Pinch the edges together, as you prefer. Crimp, scalloped, no matter just make sure they are sealed up. In a small bowl whisk your egg with 1 tbsp. of water and then brush the entire crust and sprinkle with pizza seasoning. Bake for 50-60 minutes. Let stand 10-15 minutes before slicing. This is incredible! I hope you enjoy it as much as we did! I brought you a sweet treat! I actually brought you a freezer clean out recipe! I have made these 2 times since for different friends. I have always been a bigger fan of sugar cookie dough, than chocolate chip dough. My best friend used to make me sugar cookies with white chocolate chips in them all the time. I LOVE them still! I had run on a sale on this cookie dough and so I grabbed a couple and hadn't used one of them. I needed to clean out the freezer and so I took what needed used up and came up with these beautiful, yummy babies. I tend to have little patience for scooping out cookies. I took the easy way and baked them as bars. They take a bit of time to bake but don't worry, they are worth it. Make sure to take the bars out maybe even before you think they are perfectly done, they will carry over cook and you don't want hard bars! I added sprinkles to mine, because I have this thing about brown cookies. They needed a pop of color! These are perfect for bake sales by the way!! Preheat your oven to 350. Combine cookie dough and chocolate and butterscotch chips. Spread into a 9x13 cake pan and even it out as best you can. Sprinkle the top with sprinkles and bake for 35-45 minutes. Let cool 10 minutes before cutting! Easy, huh? I know! And yummy too! Is winter an odd time to be writing and posting recipes for ice cream? Oh well. I had a reader tell me that more ice cream is consumed in the winter than the summer. I don't need proof, I am going to believe it because it is convenient for me. HA! Remember Bess, my lunch buddy at our favorite Chinese restaurant? Well, we have another lunch friend in our posse as well, her name is Dee! She is one of those ladies, you just love being around, she is happy, positive, loving, caring, kind...I could go on and on. She has a beautiful family and we all love our lunch visits! On my birthday Dee brought me the cutest ice cream serving dishes shaped like cones! I decided I had to do a recipe for her favorite ice cream which she informed me was Butter Pecan. 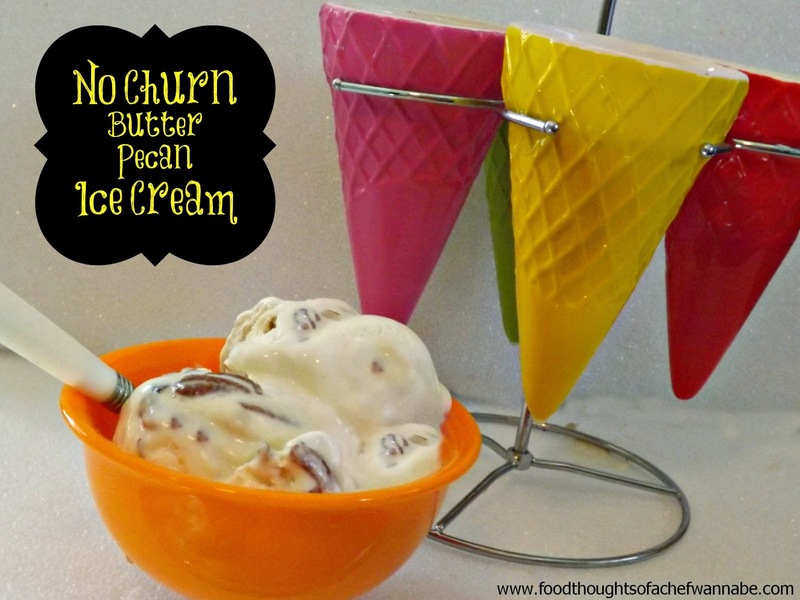 (I always used to think Butter Pecan was for the over 80 crowd) I am obviously wrong! HAHA! I wanted to use this darling set for a photo as soon as I could because I LOVE it! Thanks Dee, for your friendship, your kindness and pure goodness you bring to our lives! Note: The ice cream cones, had to take a background position due to photographing the ice cream on an almost 70 degree day in FEB, and it melting REPEATEDLY on me. Nothing more can be said. Grrrr! This is an easy recipe. It is so rich, but oh so delightful. This recipe will make exactly 1 quart of ice cream. In a bowl, whip your heavy cream to stiff peaks. Set aside. In another bowl combine, condensed milk, brown sugar, pecans and cooled melted butter. Using a hand mixer combine thoroughly. Using a spatula cold the heavy cream into the sweetened condensed milk mixture. When all is combine, put into a plastic container with a lid and freeze for at least 6 hours. Overnight would make it even better. Enjoy this, maybe even on a piece of PIE! OOHHH!! Yes, that is what I did when I realized I needed a dessert last night for company. I wanted something green. This is what I pulled from my cupboard. I think we can all appreciate a semi-homemade convenient dessert in times like these, can't we? When I decided to make this I had to name it. Well when I was at my parents over the weekend, we were going through old photos and boxes of "stuff". (I have a craftier word for it). We found this little project my sister Patty did in probably 3rd or 4th grade. She was to write about her nickname, an embarrassing moment, a trip, getting lost, etc. We laughed so hard at the things she wrote, and it reminded me that as a kid one of our uncles always called her "Pits". Since her birthday is on St Patrick's Day and her nickname was "pits", what...that sounds horrible now. Who wants to be called PITS? I am sorry Patty, I am sorry you had to endure a childhood of being called after one of the smelliest parts of the human body. We never thought of it like that then, but as an adult, my sincerest condolences!! 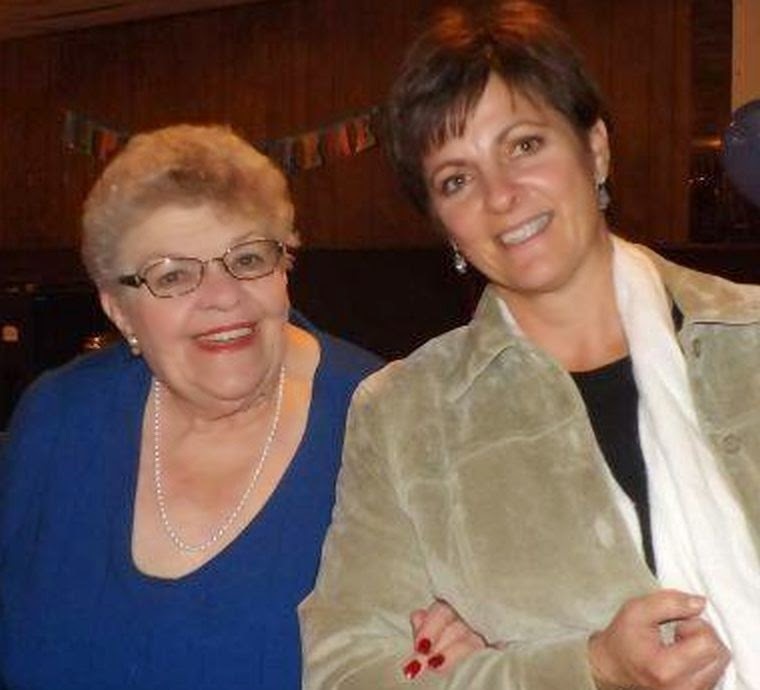 Here is the birthday girl herself with our mom. 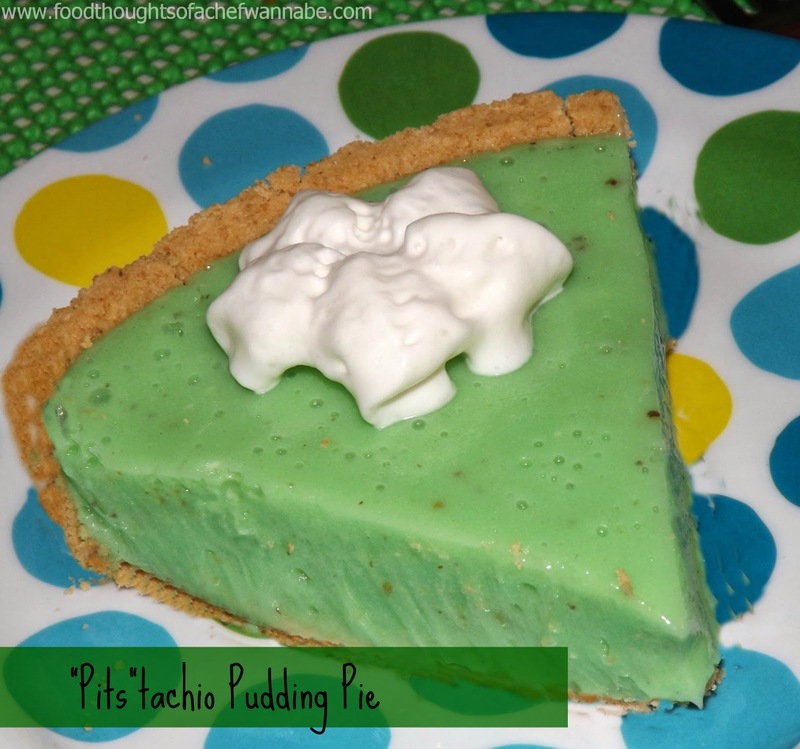 So as I mentioned this is one of those throw together pudding pies, I just happen to like this one I made, ALOT. Combine pudding, marshmallow fluff, and milk in a blender. I find a blender way easier when it come to sticky marshmallow fluff. Blend until a smooth consistency is achieved. Pour into your prepared graham cracker crust and refrigerate at least 2-3 hours. ENJOY and Happy St. Patrick's Day my friends! Bottoms UP! My husband is more hooked on cooking shows than I have ever been. I have just not ever been a HUGE fan of them, accept Anne Burrell. She is the epitome of passion in the kitchen to me! 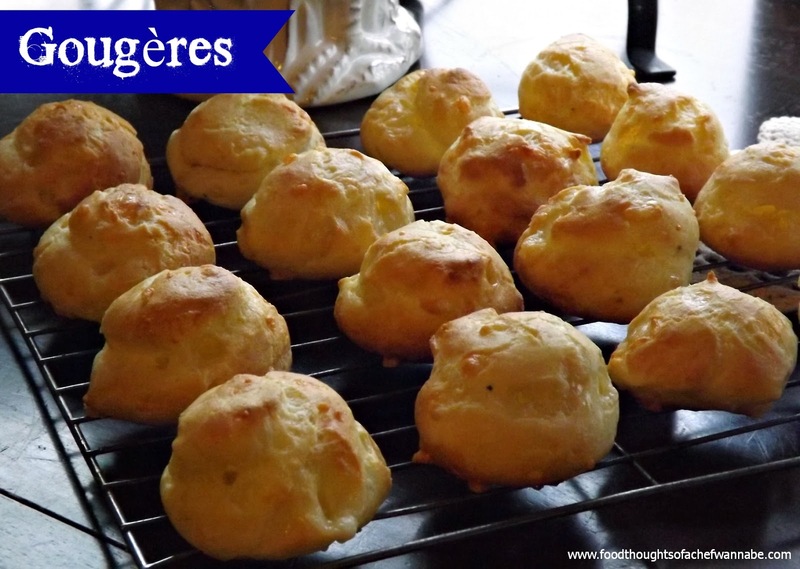 Anyway, Geo was watching some Internet cooking show and these "gougeres" were prepared. He thought they looked amazing, found the recipe that was used and I adapted mine from that (Food and Wine). I took out the nutmeg, I suppose that is a HUGE no-no in the French cuisine world but I did it. I make the rules in my kitchen after all, right? I also think nutmeg is completely overrated and if I see it go into one more cream sauce I am going to turn inside out! These are easiest to describe as little savory cream puffs with cheese. How can that be bad? I envision these cracked open and filled with a little chicken salad, or caramelized onions or something of that sort as an appetizer. I hope you enjoy, these are easy, but so impressive and delish! Preheat your oven to 400 degrees. F. Lay 2 baking sheets with parchment paper and set aside. In a medium saucepan, combine the water, milk, butter and salt and bring to a boil. Add the flour and stir it in with a spoon until a smooth dough forms and the dough starts pulling away from the sides. It should take a minute or so. Transfer your dough into a bowl. Let cool for 2 minutes. (I put mine into my stand mixer bowl). Beat your eggs in, one at a time. Make sure each egg is COMPLETELY incorporated before adding the next egg. Add cheese, a good pinch or grind of pepper and mix again until it is incorporated. Place your dough into a pastry bag. Cut the tip of the bag so you have about a 1/2 inch diameter opening. This isn't like, written in stone, so just eyeball it. Pipe about a tablespoon size amount of dough, Make sure they are about 2 inches apart. Bake for approx. 22-25 minutes. Let cool a couple of minutes before serving! How many times have you heard, "Oh I make the best French toast", or "everyone always wants me to make French toast"? The entire time you are thinking, "Yea, yea, yea, none of you have EVER had mine". OK, well I am. 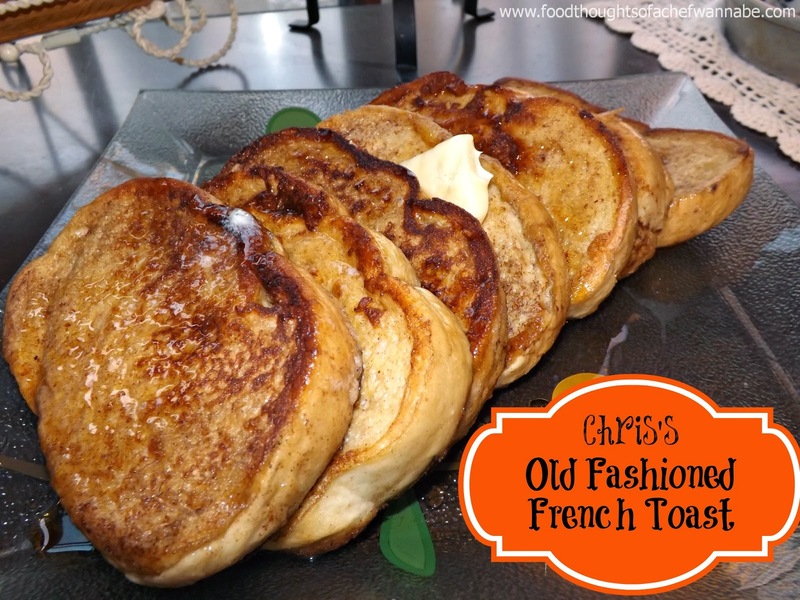 French toast has been one of my breakfast specialties for a long time. French toast is a lot of people's specialties. I mean let's be honest here. You add about anything you want for flavor and texture and all kinds of goodness. Maybe I just use the secret correct measurements. Think? Yes, I am arrogant about mine, because it is mine. If you are going to be arrogant about something at least be able to share it with others! I make this for dinner, lunch, breakfast, brunch, after the bar closes, (jk) but you definitely could! It is easy and seriously it is likely no secret, but I wanted to share even the easiest of recipes, because there are people out there, who have never made it. I hope they pick my recipe to try for the first time! This will make about 12 pieces of toast. I use the Texas toast in a bread bag, not the frozen stuff. Whisk all ingredients very well. Heat your griddle or skillet and melt in 1 tbsp. butter. Dip bread into egg mixture, flipping it a couple of times and place into your skillet. Fry on medium until golden brown and flip, frying again until golden brown. Serve with butter, syrup, or powdered sugar. Maybe some sweetened, whipped, heavy cream? Oh YES! I can't be the only one who lusts after these unhealthy things, right? I mean, they are just so tasty, you can't help but wonder why they don't offer seconds! This prompted me to try a copycat recipe. I tried a couple and they were way out of the park, I mean like, WAY off. I have read so many of these recipes and some are so completely different I wonder which one is out of their MIND and which is close! I have heard they use Colby, no they use cheddar, no they use Velveeta....well guess what?!?! I took my own ideas with a few hints from these other recipes and though I wouldn't say it is "OMG, EXACTLY" on, I would say it is the closest I have come. I am using a cream soup in this bad baby. If you have a recipe for a cream soup, go with it, I am using it for the sake of time, and yes, even the flavor. I would venture to say you could change cream of chicken out for cream of mushroom as well. Sometimes I used canned cream soups, sue me. I don't necessarily enjoy the fact they are processed and sodium laden but hey, sometimes, a girl wants that kind of thing in her food. You have choices, just use them if you don't groove on it. 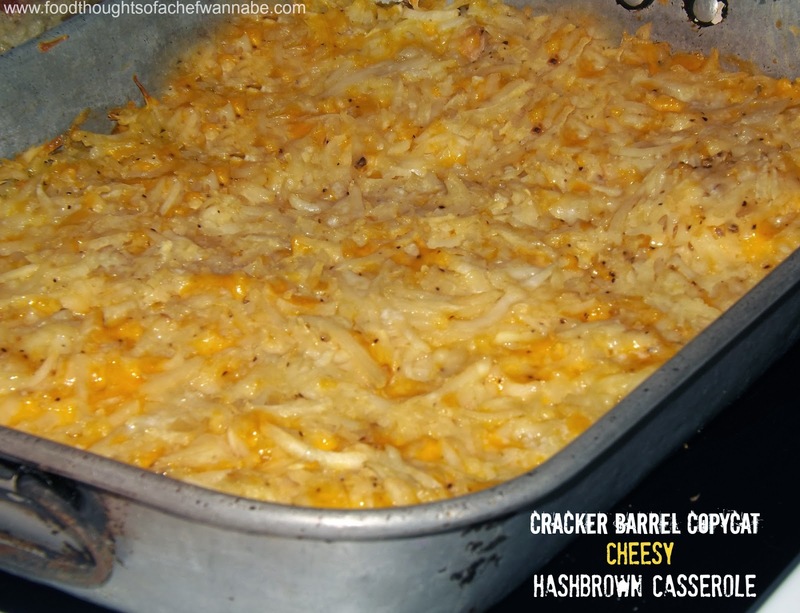 This is really easy and even if it isn't EXACTLY like Cracker Barrels, it is really good and such an easy side, especially for a crowd! Preheat your oven to 350 degrees F. Using a large bowl, combine ALL ingredients and stir. Better yet, wash your hands well, or use gloves and do it with your hands, because this is serious mixin' kids. Pour into your 9x13 pan, which you have sprayed with nonstick cooking spray, spread out evenly and bake 50-60 minutes. They will be golden and bubblah when you take them out! Please let them cool a minute before you serve, nobody needs to lose mouth skin here. And let's face it, everything tasted better in my mom's very old 9x13 she gave me. Do you have ANY idea how juvenile my husband and I can be? Oh, yea, we can be. We just do it in the privacy of our own home! Can you imagine the names we came up with for this cake? I could get into detail but I will spare you the ridiculousness. I had never made a cake roll and it has been just screaming at me to do! So here it is, the first one ever, that I have done. 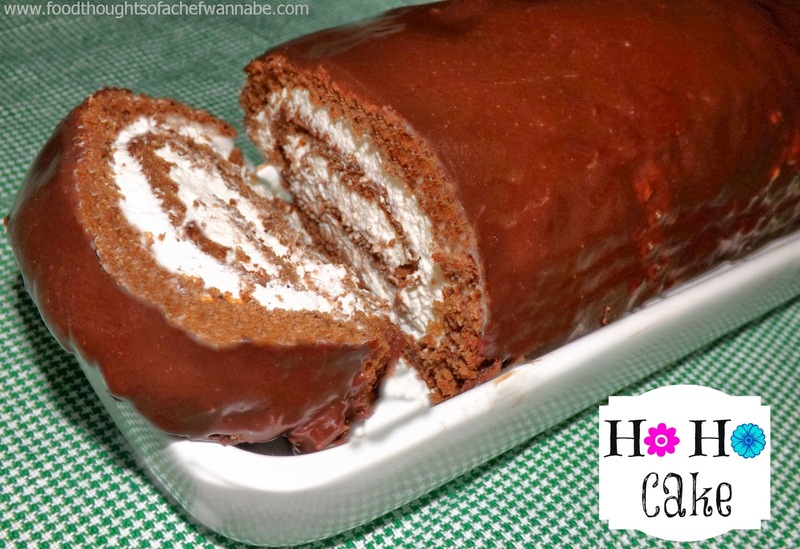 I know a traditional HOHO or SWISS CAKE ROLL probably doesn't use a milk chocolate ganache, but can I just tell you how AH-MAZEBALLS it was on this cake? Notice I use the past tense, because this baby was shared, and devoured! I wanted to just experiment and give this a go, and low and behold, it was so easy. You may get discouraged by the length of the directions. It is a few more steps, but NOT at all hard in any way. Just prep work to make it turn out as lovely as you had hoped! You can choose to just dust it with powdered sugar or cocoa. You could eve just drizzle it with some chocolate or leave it plain. That is all in your hands, you decide, but my HOHO Cake had to be as close to the read deal as I could get! Now get to it!! Preheat oven to 400 degrees F. Sift together flour and cocoa powder into a bowl. Set aside. In a heat safe bowl whisk together eggs and sugar until combined. Place over a pot of water water and whisk until it begins to warm the mixture. Switch to an electric mixer and continue to beat constantly until it has tripled in volume (or close to it!) Remove from the heat, and gently fold in the flour/cocoa mixture. Prep your pan, a 12x16 jelly roll/cookie sheet pan. Spray with nonstick spray, lay a piece of parchment on the bottom to cover the entire bottom and then spray again. Spoon mixture into the pan and smooth until even. Bake for 7-9 minutes or until the cake springs back in the center when slightly pushed in. Remove and let cool 5 minutes. While it is cooling, lay out on your counter or table a lint free dish towel. Dust with cocoa powder and flip the cake out until the towel. Carefully roll the cake up in the towel. Flip the end of the towel over the end of the cake and roll. Leave in the towel and refrigerate for 1 hour. Whip with a stand mixer or electric hand mixer until stiff peaks. I like to over beat it just a few seconds. I like super stiff peaks! Remove cake from the fridge and roll out carefully on the counter. It is OK if it won't flatten all the way. That means it won't crack when you roll it back up! YEAH for you! Spread the whipped cream all over leaving about a 1/2 inch border all around. (you may have some cream leftover, just keep it to serve along side!). Now roll the cake back up using the towel to help push it along. Place it on a platter seam side down and prepare your ganache! Warm heavy cream until fairly hot. Put chocolate chips in a bowl and pour the hot cream over the top. Add butter and vanilla let it sit for 1 minutes. Whisk until all ingredients are combined and the chocolate is melted. Place cake on a piece of parchment paper (I used foil) or cooling racks. Pick up carefully and dip each end in the ganache and let it drip off. When both ends have been dipped, place the cake back on the racks and slowly spoon over the ganache until it is all covered. If you have extra ganache you can do two coats, let the first one set in the refrigerator first. OR, you can let it cool, whip it with your beaters and have the best frosting for cupcakes, EVER! It is not difficult, just a few steps to this fantastic, DELISH, GIANT, HO HO cake! Enjoy! And GEO-NORMOUS it is! Ok so it is Ginormous but since this is hubby's recipe, he gets to call it Geo-normous! 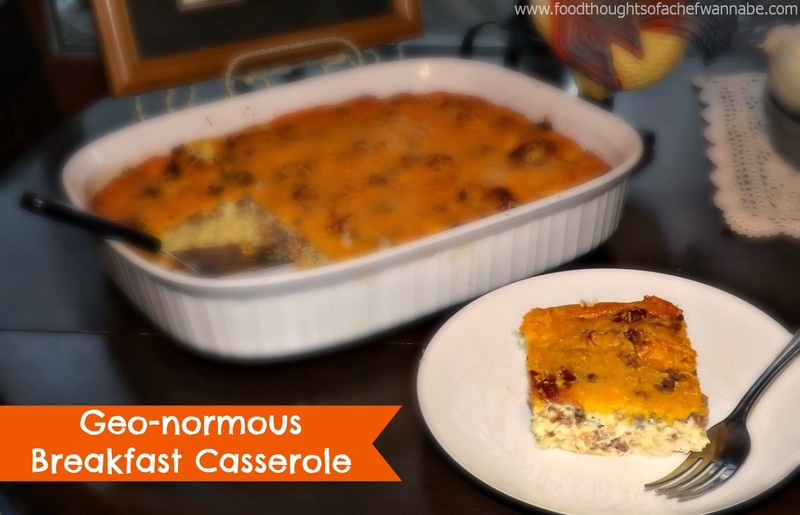 He has been telling me "you don't have a breakfast casserole on your website", because, I guess he trolls my website for hours at a time and checks on these things! ROFL. Seriously, do you guys know how fun and hilarious this guy is? Anyway, so he said, just make something easy that anyone could make and that will feed a ton of people. My response was "Ok, give me an ingredient list and I will work it out". I guess he didn't realize how easy a breakfast casserole would be to make! He gave me his list, and I picked it up. Now fast forward to today, when I finally made it. SO good, so perfect for a crowd. SO PERFECT for making ahead, so perfect for...everything! You might shriek at the ingredients. Keep two things in mind, 1) a man requested this and these ingredients, and 2)this should feed a good 8 people. I would serve this with some bread and some fruit and call it breakfast! 1 pkg (just short of 2lbs) shredded hash browns. Preheat your oven to 375 degrees F. In a frying pan, brown sausage, when it is done, remove and place on a paper towel lined plate. In the same skillet, crisp up your bacon well. 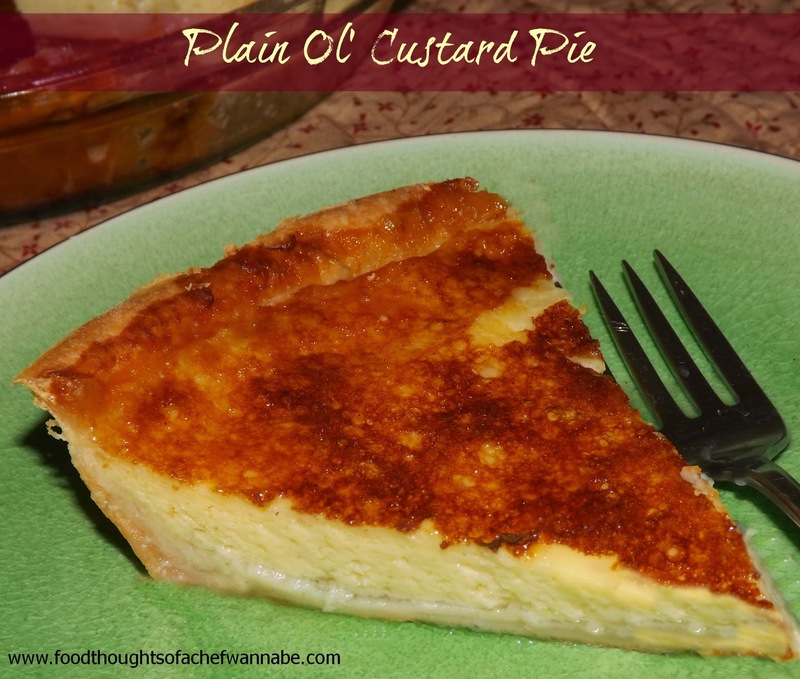 Crumble or cut into smaller pieces when cooled and drained of grease. Now brown off your hashbrowns, in 2 or 3 batches. When they are done, place them in the bottom of a 9x13 (ish) pan that has been sprayed with cooking oil. Spread them out evenly and sprinkle on the sausage and bacon. Now in a bowl combine the eggs, milk, onion powder, salt and pepper and whisk well. You could even use a hand mixer to incorporate a little more air into these eggs. 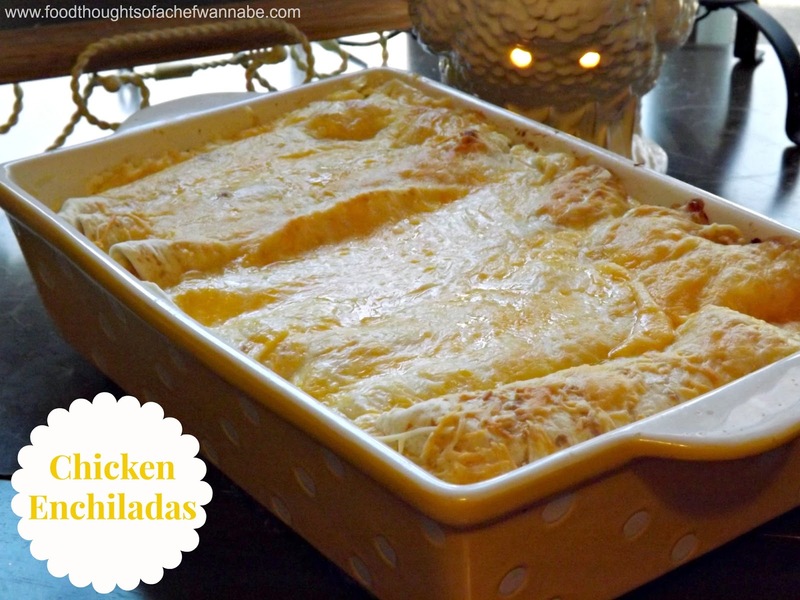 Gently pour over the ingredients already in your baking dish, top with the cheese and bake 30=35 minutes. Now, put on the coffee and dig in!